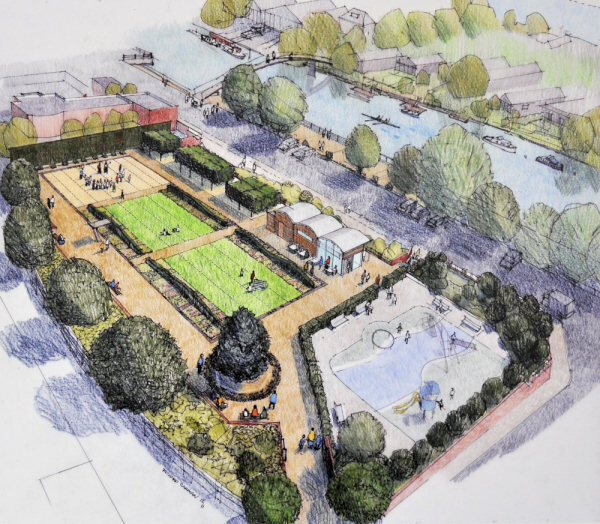 The council's plans to open up a large section of the poolsite include a grassed area and a paved public square and keeping the children's play area where it is. There would be a new feature to mark the Diamond Jubilee. 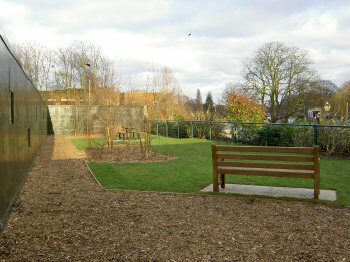 Work should start in February 2012 and the gardens are expected to open in June. 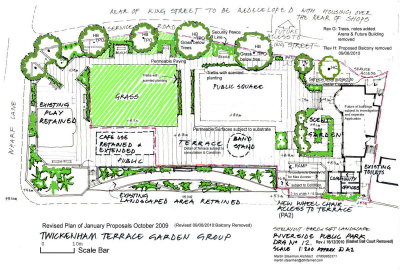 Submit your comments via the paper forms at the displays or online to the Jubilee Gardens Feedback. There will be a consultation in 2012 on the rest of the poolsite (including the former cafe and caretaker's house, now home to HANDS, the local care and support the charity.) The plans are based on the planning permission already received by the Twickenham Riverside Terrace Group (TRTG). Funding of around £500,000 for the work will come from the Council. 'The site will be cleared of 30 years’ worth of weeds, building materials and debris, to be landscaped into three sections: A simple grassed area immediately behind Café Sunshine, a park space in front of the old diving board, which will be kept as a memorial to the long struggle to re-open the site and the last, closest to the old changing rooms, would be paved to become a public square. The Council hopes that square will tie in to plans for the currently built part of the site that will be brought forward after further consultation in 2012. All three would be linked through a running pattern replicating the lanes of a swimming pool, linking to the site’s history. 'An improved entrance to the site from Wharf Lane will be created next to the play area, making it easier for shoppers in King Street and Heath Road to find the site. Pride of place will go to a new feature commemorating the jubilee. 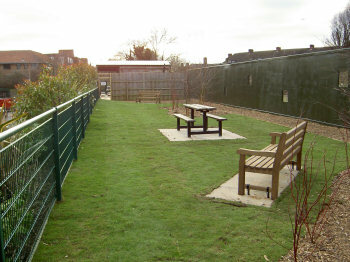 The play area will be retained and bounded by a low hedge to keep dogs out. New railings and trees will be installed around the edges of the site for safety and to create ambience. On Saturday 11 June the council launched the consultation into the short, medium and long-term futures of Twickenham town centre and the riverside. Following on from the All in One consultations in 2010, several main areas for concern have been identified. Three scenarios have been developed and public comment is invited. Of particular importance are the three scenarios for the poolsite and the riverside, which have possible knock-on effects on traffic and parking, the farmers' market, the riverside economy on Eel Pie Island - businesses and clubs - and the residents on the mainland. These need attention and the consultation leaflet merits close reading. Useful documents relating to the riverside and the poolsite. 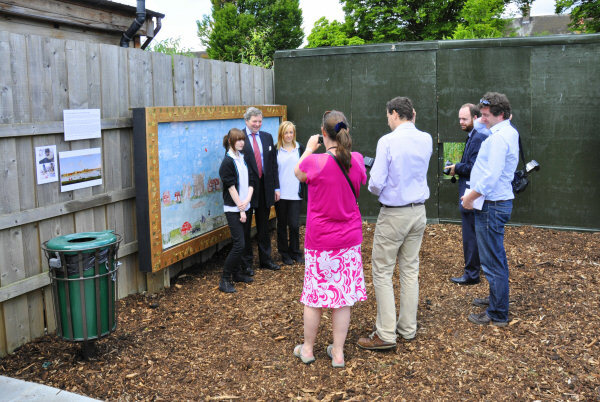 Launched in June 2011 by Lord True, Leader of the Council, The Frame is a changing display of artwork created by young people and community groups working with Orleans House Gallery. The aim is to showcase and enjoy local creative talent in beautiful natural settings. The frame itself was designed and constructed by artist Roger Hutchins. 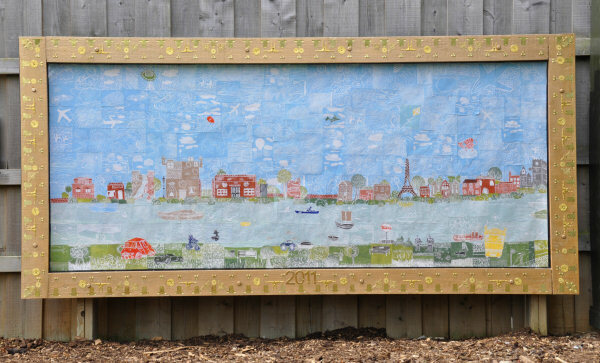 The first display is inspired by The Thames at Twickenham by artist Peter Tillemans. Painted in around 1724, it is the earliest topographical view of the river frontage at Cross Deep, and depicts many historical buildings which have long since vanished, including the villa of the celebrated poet Alexander Pope. The painting is one of the highlights of the Richmond Borough Art Collection cared for by Orleans House Gallery. The finished work needs to be seen up close to appreciate the details. Assisted by artist Rachel Craddock, young people participating in holiday activities, art students from Hampton Academy, Orleans Park School and Waldegrave School for Girls produced a contemporary interpretation of this important local landscape. Students carved their images into individual lino tiles which have been scanned, printed and collaged together to create a contemporary landscape. Further detail can be seen on the Terrace Group's website. 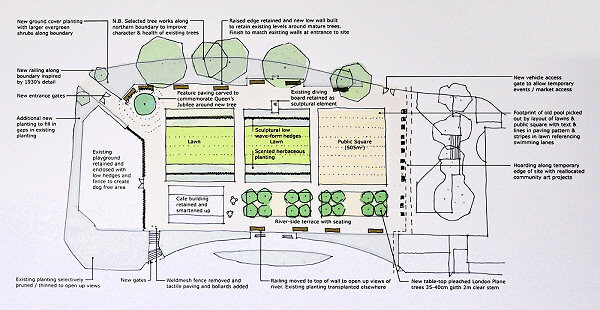 In their presentation, the Group said that the redevelopment - clearing the poolsite and landscaping - would cost around £800,000, though that was on the basis of an application for a permanent scheme. The temporary nature of the permission may change that. The application does not include the old pool buildings - the derelict toilets, the derelict former café and the caretaker's house, which is used by the charity HANDS - Help a Neighbour in Distress. Nor does it accord with several of the stipulations in the T1 planning brief for the site - including housing, some retail, river-related uses and bringing people into the area. (For detail, see section 12.54 about halfway down the page at http://www.cartogold.co.uk/Richmond/text/12_local_strat_twickenham.htm). However, the Terrace Group say that the buildings will be subject of a later planning application that should bring the whole site into accordance with T1. A trust will be set up to manage the project. The constitution and membership of that, and the sources of funding, were not revealed. As well as the temporary status, there are other, stringent conditions - work has to commence within 3 years - and a lot of detail remains to be settled. The planning officer was also at pains to say that the permission wouldn't stand in the way of future planning applications for the property. Immediate neighbours of the site are concerned about the security of the area at night, and a return to the vandalism, antisocial behaviour and noise (plus problems with flytipping and litter) that occurred before the current high fence was erected. These and other matters, like lighting and legitimate night-time use, will have to be dealt with in the later stages. Access to the new secret garden is through the wooden door at the end of the terrace in front of Café Sunshine. The door tends to stick and may require some force to open. Inside, the garden is 10 metres by 40 metres. The holes in the hoarding look out onto the remainder of the poolsite. Item one: After nearly two years, the Twickenham Riverside Terrace Group's planning application for the poolsite will be considered by the planning committee on Thursday 3rd February at 6.30pm. For details, see the Terrace Group's website. 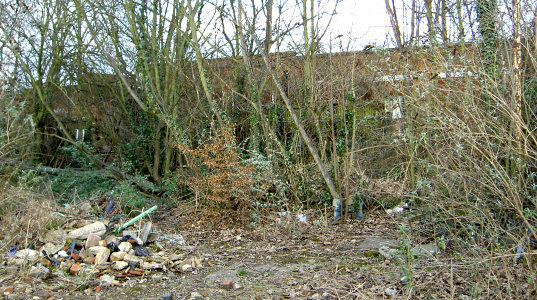 Item two: Note from the council: "We are pleased to announce that a further area of the Twickenham Riverside site will be opened up to the public on Wednesday 26th January 2011 at 11.30am. I do hope that you will be able to come along on the day and join us at this event. If you are aware of anyone who may not be notified by this circulation, we would be grateful if you could let them know of the arrangements for the opening. There is no need to confirm your attendance and we look forward to seeing you on the day." This follows work by BTCV (British Trust for Conservation Volunteers) and some local people to open a 12 metre-wide strip from beside the Café Sunshine along the top of the gardens. 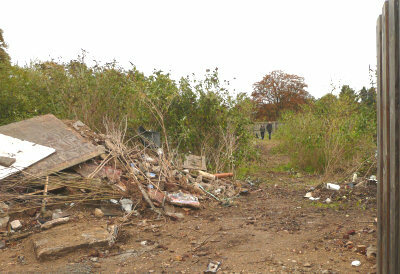 The remainder of the site is still overgrown and full of rubble. Page last amended 25/7/13. All photographs and text on this site are © Twickenham Riverside, unless otherwise stated.